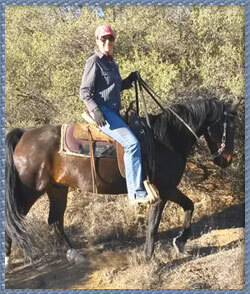 Most 4 beat gaited horses are in high demand for trail riding regardless of their breed. The Walking Horse, Fox Trotter, Rocky Mountain Horse, Spotted Saddle Horse, and a few more..If you are looking for gait, you are probably looking for one of these. There is another gaited horse that usually gets overlooked. Many people don't even know what they are, much less, that they GAIT: THE AMERICAN STANDARDBRED. Because of the similarity in their names, some people confuse the Standardbred with a Saddlebred. They are as "similar" as an Arabian and a Quarter Horse. Saddlebreds are the peacocks of the show ring, high stepping, lots of knee and hock action, flashy, and on the "hot" side. Standardbreds are most know as a racehorse that pulls a cart. Because of this, there is a misconception that, they too, are hot blooded and prefer to go fast. This is not true. By and large they are very gentle, calm, willing and easy to train. 80 to 90% of Standardbreds are raced as pacers. In a race, they usually wear "pacing hobbles" to insure that the horse will not break out of the pace at speed. When these hobbles are removed the horse no longer does a true 2 beat pace but a 4 beat gait. 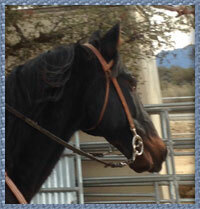 Depending on the individual horse that 4 beat gait will be a stepping pace, running walk, foxtrot, amble or rack. There are literally hundreds of these horses that retire from the race track every year with 1000's of hours of training in harness, training that gives these horses a wonderful foundation for a new life as a trail horse. They have been exposed to the harness, cart, cars, flags, loud speakers, flood lights and cheering crowds. The ultimate in "sacking out". 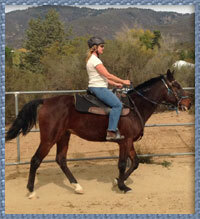 Looking for a GAITED horse?